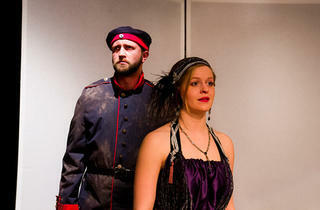 Prop Thtr finds percussive force in Brecht’s early postwar drama. Prop Thtr embraces Bertolt Brecht’s 1922 work about post–World War I Germany with tender attention; this is an angry young man’s play with flaws, revelations and tons of raw power. Brecht drew on his own wartime service to shape the story of Andrew Kragler (Nick Leininger), who returns after four years as a POW in Africa to claim his sweetheart, Anna Balicke (Arin Mulvaney). Too bad she’s already engaged to exquisitely priggish Frederick Murk (Joe Bunke), whose parents (the terrific Karen Fort and Don Schroeder) are irked when Kragler comes lurching back into their lives, physically and mentally scrambled from battle. In the Balickes’ world, the veteran’s reappearance and declaration of love are grotesque; in the prostitutes’ saloon, they’re almost boring. In the rioting streets, only Kragler’s body and philosophy matter; lovesickness is a handicap. The actors speak Brecht’s lines—poetry, pleasantries and knife-edged aphorisms—with a welcome precision of diction. (As journalist Babusch and a stuttering waiter, respectively, Andy Somma and Rory Jobst strike a lower key that slows the play’s momentum.) Brecht was famously suspicious of audiences’ emotions, but Mulvaney and Leininger in particular turn this lesson in human cruelty and fragility into a moving, contemporary drama.